The annual Wanee Festival, hosted at Spirit of the Suwanee Music Park in Live Oak, FL, has officially revealed its 2016 lineup! Now in its 11th year, the lineup includes plenty of Wanee regulars, as well as some new faces. Originally started as an Allman Brothers Band family festival, most of the remaining members’ outside projects are on the list, including Gregg Allman, Gov’t Mule, Jaimoe’s Jasssz Band and Oteil and Friends. Widespread Panic, Umphrey’s McGee and Hot Tuna are also regulars of the Wanee scene, as well as Devon Allman, while Soulive, Conspirator and North Mississippi Allstars have been known to appear in the past. Notable Wanee virgins include The Stanley Clarke Band, The Wood Brothers, Kung Fu and Big Something. Noticeably absent from the lineup is the Tedeschi Trucks Band, whose lead guitarist, Derek Trucks, is a longtime member of the Allman Brothers Band family. 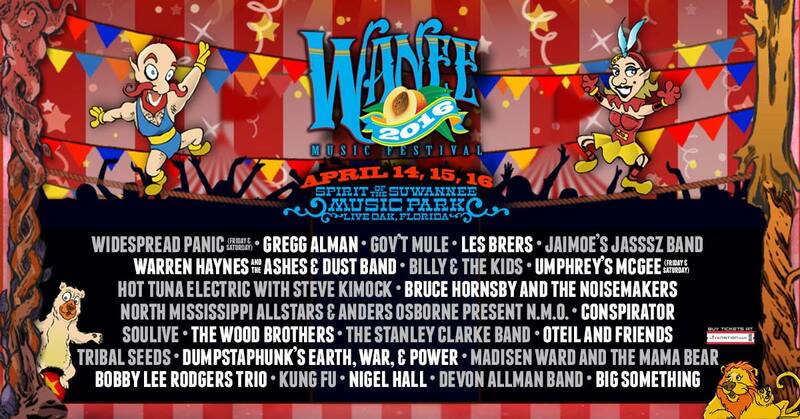 Even with the absence of TTB, there is a lot to be excited about on this year’s Wanee lineup, which will take place April 14-16, 2016! This entry was posted in Festivals, Just Announced and tagged 2016, Allman Brothers, Allman Brothers Band, Big Something, Festival, Gov't Mule, Gregg Allman, Hot Tuna, Jaimoe's Jasssz Band, Kung Fu, Live Music, Music Festival, Stanley Clarke, Umphrey's McGee, Wanee, Wanee 2016, Widespread Panic.